While it’s interesting to see what Nintendo has to say, we don’t believe the comment here is overly important. Representatives are limited in what they can share, and we wouldn’t expect them to provide any significant information. The “at this time” bit also leaves the door open to future possibilities. The Legend of Zelda: Concert 2018 kicked off in Japan this week. Normally you wouldn’t expect any sort of major news from that type of event, but something noteworthy did in fact happen. Zelda series producer Eiji Aonuma reportedly appeared at the concert this weekend. Based on messages from fans who attended and posted on social media, Aonuma said: “We know what you are thinking, Skyward Sword on Switch, right?” That prompted the audience to clap and cheer. Nintendo has been bringing the 3D Zelda games to new systems one by one, so a new release of Skyward Sword would make sense. Ocarina of Time and Majora’s Mask hit 3DS while Wind Waker and Twilight Princess landed on Wii U. Could Skyward Sword on Switch be next? 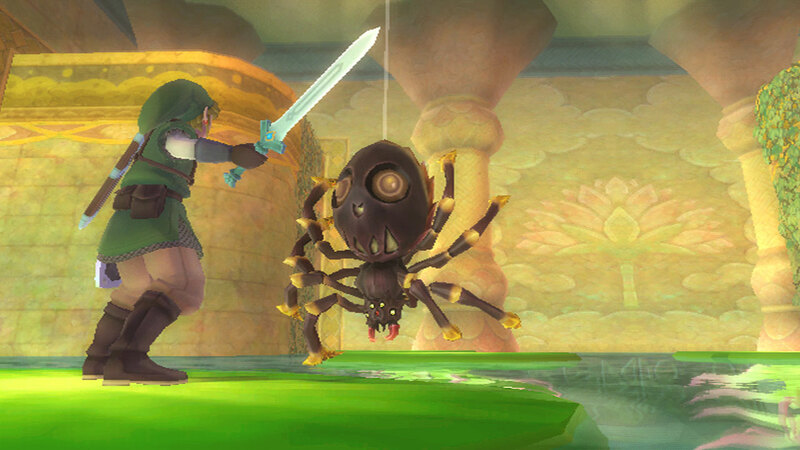 Yesterday, The Legend of Zelda: Skyward Sword dropped on the Wii U eShop as the latest Wii download. Watch some footage below. Good Smile’s previously-announced 1/7 scale PVC Link figure from The Legend of Zelda: Skyward Sword now has a release month. It’ll be available in November for 15,800 yen. Pre-orders open today, and will last until July 27, 2016 at 9 PM JST. 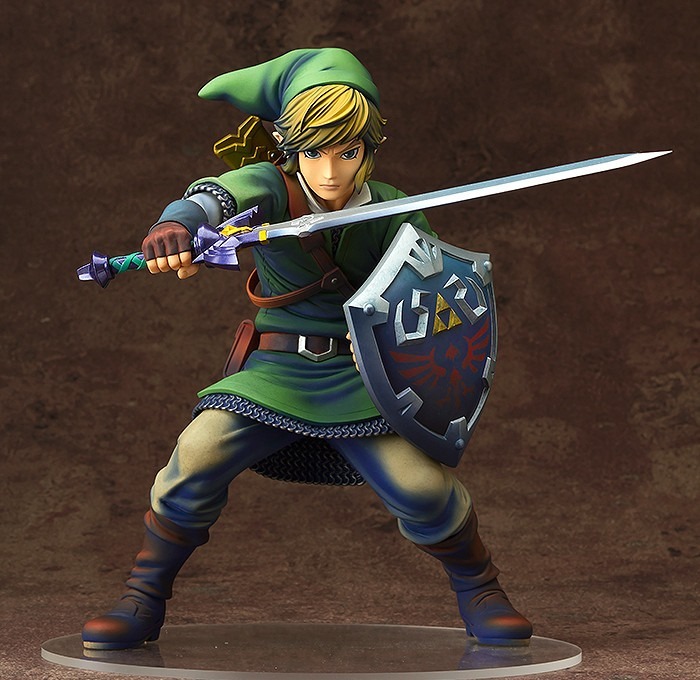 A pair of new statues based on The Legend of Zelda: Skyward Sword came out at GameStop and EB Games just a few days ago. 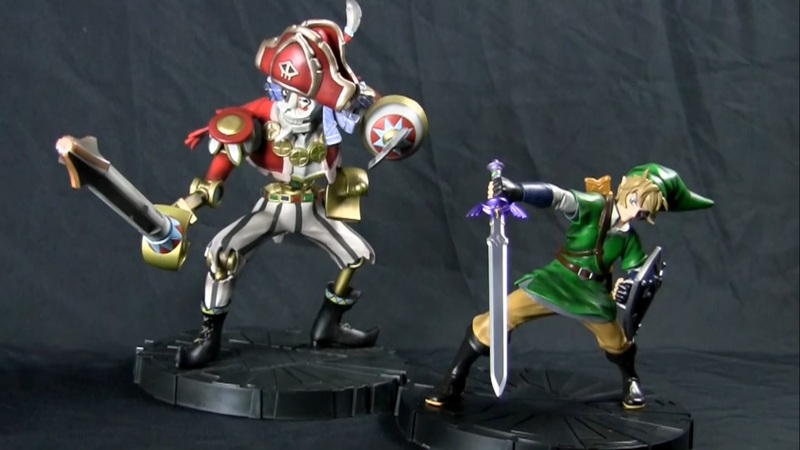 There’s one featuring Link as well as the robotic, skeletal pirate Scervo. Pricing is set at $79.99 ($119.99 CAD) and $124.99 ($139.99 CAD) respectively. If you’re in North America, you can order the statues here. Canadian gamers can grab them here. The Legend of Zelda: Skyward Sword introduced us to the memorable character Groose. But as it turns out, this wasn’t his original name. While he may be known as Groose in the west, his Japanese name is Bado – essentially a reference to bird. 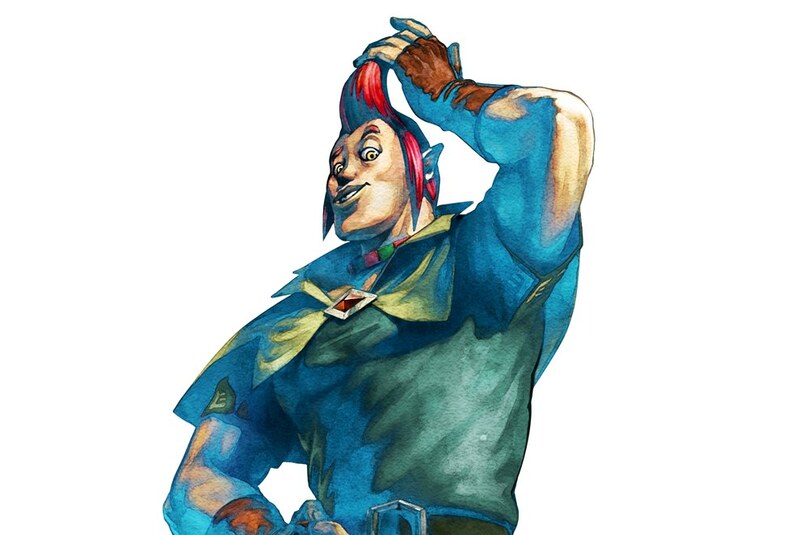 Groose’s localized name was created by former Nintendo Treehouse staffer Mike Drucker. On last week’s episode of the GI Show, Drucker talked briefly about how he came up with the idea for Skyward Sword’s character. During a naming meeting, Drucker was told that Groose was a jock and sort of a jerk. 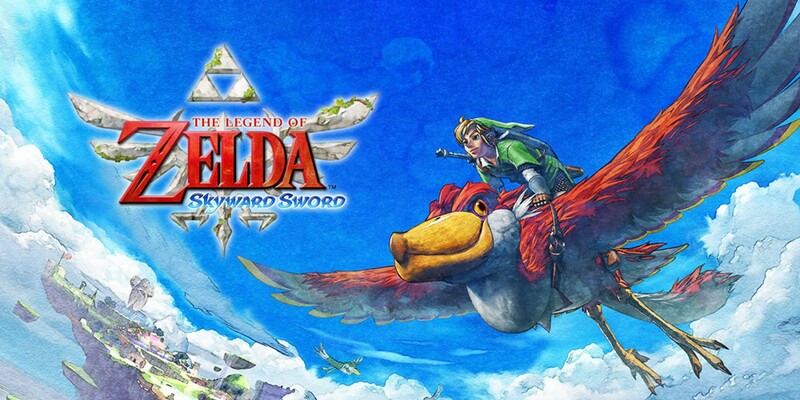 Nintendo was also trying to stick with a bird theme with Skyward Sword. With that information, he went from “Bruce” to “Goose” to “Groose”. We’ve included the podcast segment in which Groose is discussed below. The whole talk is actually very interesting though since Drucker spoke about his days at the Nintendo Treehouse (before eventually moving on to The Tonight Show! ), so you should definitely give it a watch. Another new 3DS theme has arrived in Japan. 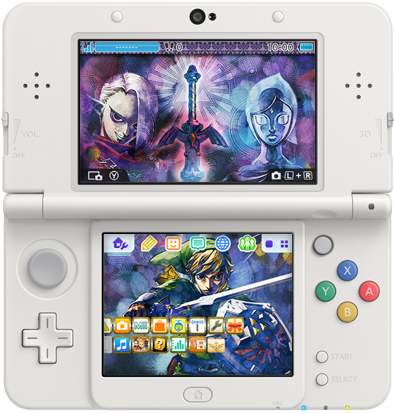 As of today, users can purchase a theme based on The Legend of Zelda: Skyward Sword for 200 yen. One of the more common complaints with The Legend of Zelda: Skyward Sword concerned the game’s tutorials. Many felt that there were too many of them, especially at the beginning. This is something that series producer Eiji Aonuma has learned from. 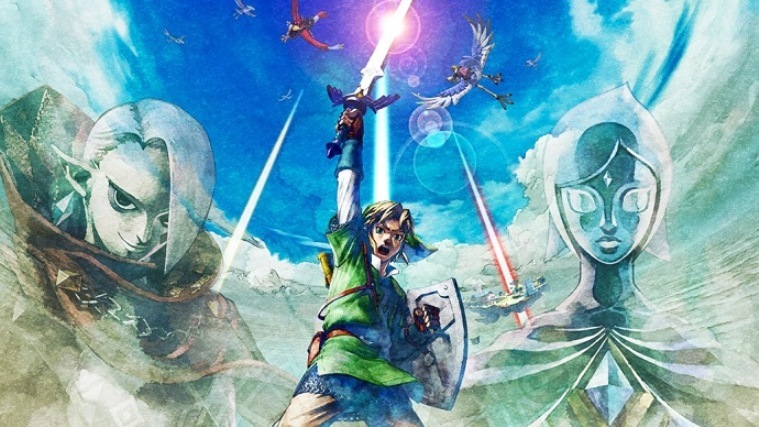 Aonuma told Kotaku that he now understands “that when you go out and buy a game, you buy the game because you want to play it, and you don’t want to have any obstacles in the way.” Additionally, he admitted that Skyward Sword’s tutorials were “frontloaded”.